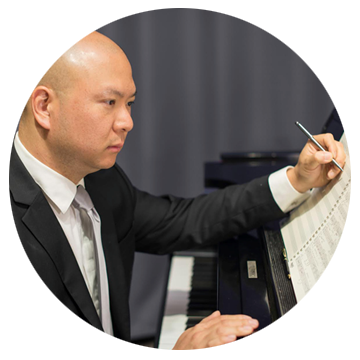 New York born Yoon Jae Lee enjoys a multifaceted career as conductor, arranger, pianist, educator and musical entrepreneur. He is the Founder and Artistic Director of Ensemble 212, an ensemble of young musicians known for their innovative programming of works including many world premieres as well as the standard repertoire. He has an extensive list of appearances as guest conductor and soloist with orchestras in North America and Europe. He is the principal conductor of the Albano Ballet Company which has presented his chamber arrangement of Tchaikovsky’s The Nutcracker. His arrangements and orchestral reductions have been performed by leading orchestras including the Baltimore and Phoenix Symphony Orchestras. In 2013 Symphony Nova Scotia played his arrangement of Mahler’s Symphony No. 4 to much acclaim. This season’s guest conductor Dina Gilbert has also conducted the No. 4 in with orchestras in Montréal and Thunder Bay. In 2002 Yoon Jae Lee was Inspired by the chamber-like qualities he found in Mahler’s Symphony No. 4 to arrange the work for a small orchestra. It was to be a “one of” however after its premiere in 2006 the success of his reduction led him to consider the benefits of arranging Mahler’s monumental works for smaller ensembles. Any doubts he had about the viability of a project of such scale were put to rest when an arrangement of the final Adagio movement of Symphony No. 3 was performed on September 11, 2011 as part of a 9/11 memorial concert. The arrangement was dedicated to a church youth group friend of Mr. Lee’s who died in the attacks. He decided at that point to embark on the Mahler Chamber Project. The remaining four movements of the No. 3 were completed in 2014 and it was premiered by Maestro Lee’s Ensemble 212 in October 2015. Mr. Lee has completed reductions of the first five symphonies and Das Lied von der Erde and is currently completing work on Symphony No. 6.